Beach soccer is different and interesting from real football. This article gives more details about 2011 FIFA Beach Soccer World Cup which will be held in Italy. Check out this article to get the fixtures and qualified teams for 2011 FIFA Beach Soccer World Cup. Beach soccer is one of the best sports entertainment which is played in beaches. The emergence of beach soccer come from Brazil beaches and now it is spread all over the world. 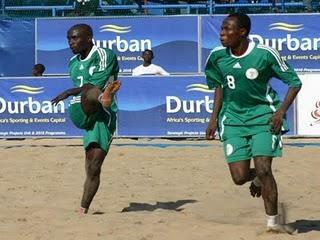 The 2011 FIFA Beach Soccer World Cup is the sixth edition of beach soccer world cup. Brazil is the current Beach football world cup champions. The 2011 FIFA Beach Soccer World Cup will start from September 1 to 11 at Italy. 2011 Beach soccer world cup is organized and controlled by FIFA. 16 teams will participate in the tournament. There will be 4 groups in the tournament where each group includes four teams. FIFA Beach Soccer World Cup will be conducted 1 time in every 2 years. The shot style and format of Beach football is interesting and special from real soccer. Now a days beach football is getting more popular in many countries. There are total 16 teams qualified for 2011 FIFA Beach Soccer World Cup which is divided into 4 groups and 4 teams included in each group.